Well that looks like the end of the surge of posts for the latest image. I'll see you all and your updated theories in 20 mins. Argh! i feel like were getting close to something major! brokeengineer wrote: Argh! i feel like were getting close to something major! You're still assuming that the view of the beach is direct, and not as viewed in reflection on a mirror, too. I don't think he looks depressed at all -- just intent upon his work. My theory is they are going to finish the sand castle, go away and then for awhile there will be just the sand castle. People will think it is over. Then the sand castle will start to slowly erode. I didn't have the ambition to read through the now more than 1000 posts, so I want to apologize in advance if this has already been considered. I think, rather than this Comic being updated with new material for all eternity by Randall's decendents or it changing itno a .gif as soon as the story is complete (Wednesday? April 1st? ), it is much more probable that it is indeed a loop (e.g. the story will return to its initial point) and will continue automatically changing every thrity minutes. This is not only more elegant but also allows future viewers to experience the same exitement of following the story like everyone who is logging the actions and possibilities here right now. NoEdge wrote: It seems kind of ironic - first he left her, now she him. Except he seems much more lonely now; before it was implied that he would be back, and now there is no such promise. Where was it implied that he would be back? They said "Bye" and "Later", nothing in that is implicit that they would meet again in the same place. "Later" implied that he would see her later. Of course, there is a distinct possibility that I am reading too much into this. But it was implied they will meet (he said "later! ", right). But that's another thing. And it isn't depressing right now. Come on, people, you're reading too much into it. You think he's lonely because of the length of the gap between updates. If he stays like this for few stripes you think it's very long, while it isn't. He's just waiting for her to return with the flag couple of minutes. That's why my post ended with: "That sounds too gloomy. I bet she's going to come back and see he built something really cool." Also, I'm amused by the fact that everybody was speculating about how this comic could be leading up to some sort of horrifying revelation for a while but the speculation stops whenever someone leaves, although that can be easily perceived as sad, far more easily than two people simply building a sand castle. This comic has been absolutely fascinating, not least because of the comic itself but the unfolding story in the 20+ pages of responses I've been reading through. Like several others here, I have been drawn in and registered just to post a quick thought, and also to praise and give thanks for this amazing piece of art. My thought; not sure if this has already been said (apologies if so), or really sure of the relevance if any, but I am certain that the two characters are children. The complete nonchalance of the 'later' / 'bye' conversation seems very much like the behaviour two kids who are perhaps otherwise strangers (or not?) playing together on a beach - perhaps while on holiday, when one of them suddenly has to leave or is maybe called away, the other carries on building. This seems to be reflected / continues through the other various comings and goings, but perhaps the girl is building the castle, and the other characters are various different temporary companions coming and going, as happens on the beach when you are young - thinking back to my own beach holidays as a child. Anyone else see a similar theme, or have similar fond memories of playing on the beach? The lack of any further conversation between the two characters, despite the various entrances / exits by each seems odd to me, and I can't think of any other explanation beyond the behaviour of young children. Just a thought. Also, again, great thread!! He is finishing the other side. NoEdge wrote: Also, I'm amused by the fact that everybody was speculating about how this comic could be leading up to some sort of horrifying revelation for a while but the speculation stops whenever someone leaves, although that can be easily perceived as sad, far more easily than two people simply building a sand castle. That's because when there were so few clues as to what this story is about, people started to search for a deeper meaning. And it's easy to let your mind wander to the worst possible scenarios, while the most obvious ones (just a pair building a sand castle) is out of reach exactly because it's so obvious. But you're right. I haven't noticed it but there were so many more sad theories when the pair was building the castle than when one of them left. Go figure. We are so eager to come up with the bad scenarios... why don't we try to think about the good ones? I'm a new member, just for this strip. I've been lurking since yesterday morning. I've joined just to add my voice to the growing choir of "This is EPIC!!! !1111eleventyone" and "I'm part of something special". Megan will be back. Her and Cueball are creating something, it's like this community here; We are like them - Doing something special. It's a love story: I don't care how it ends; It's the journey that's important. Can I put in a request to have the animated gif bumped up again please? Beatrice The Golden wrote: We are so eager to come up with the bad scenarios... why don't we try to think about the good ones? I think maybe it's a bit contagious. Everybody sees other sad theories and this affects the conclusions they come to themselves. I think he's gonna make something special for when she comes back. No, I don't think that's the reason. The thrill to watch the "spectacle" is different than to assume the story will end badly. The latter is just our depressing side coming to light. It's not the wish for these characters to have bad ending but the assumption that they will have one. NoEdge wrote: Everybody sees other sad theories and this affects the conclusions they come to themselves. Can't argue with that. I mean, when I see all the sad theories, I immediately want to counter them with a handful of good ones. Question: How do we know it's the same stick figure from earlier returning? Is it possible that an entirely new person joined her endevour? Also, I do hope there will be some way to easily access the different steps once this is over. It is a metaphor for humanity. They (we) built up a great sand castle (civilization), but in the scope of time, all the work is just fleeting and will crumble to dust before long. The question then becomes what happens to the couple (us)? Djehutynakht wrote: Question: How do we know it's the same stick figure from earlier returning? Is it possible that an entirely new person joined her endevour? That's a good point. Maybe it is a new person, and the person from before will return, and there will eventually be a large group making the best sand castle ever. Djehutynakht wrote: Also, I do hope there will be some way to easily access the different steps once this is over. I had this thought as well, although its probably more positive to envision the two as the same couple. I believe time has to move on and the castle must eventually be eroded, however, this does not necessarily have to be a negative outcome. Time simply moves on. If nothing ever changed there would be no opportunities for new people to come along and enjoy the same joys as the last couple. Destruction is creation. It's somewhat a rule of this comic that new character must be visibly different from the previous one. Otherwise - it's the same character as before. Whizbang wrote: It is a metaphor for humanity. They (we) built up a great sand castle (civilization), but in the scope of time, all the work is just fleeting and will crumble to dust before long. The question then becomes what happens to the couple (us)? It's easy to come up with references like that (especially when such common symbols as time and sandcastle are taken into account). I think the end message will be a bit more creative. Or at least it will try to be. Well, I'm not waiting for the next update. Cheers to all 350+ people still following this thread! But… but… the side is not ready yet! Is it just me or does he seem to be building more slowly than the girl? Maybe he wants to be very precise? Randall is trying to create suspense. Once again, I'd like to state that it'll be impossible for future viewers of this comic to have the same kind of shared experience that we are having as we watch it unfold, one frame every 30 seconds, with no idea of when or if it will end, or to what purpose. It reminds me of the three-year wait forced upon those of us old enough to have seen "The Empire Strikes Back" when it was released in 1980. There were so many open questions after that film (the truth behind Luke's parentage, the fate of frozen Han Solo ... oops, SPOILER ALERT! ), and there was no World Wide Web to look for spoilers and share theories. Most of us simply had to spend three full years playing with action figures and theorizing with friends until "Return of the Jedi" was released in 1983. Future generations will never experience the original "Star Wars" trilogy the same way that we did. The same goes for XKCD #1190. 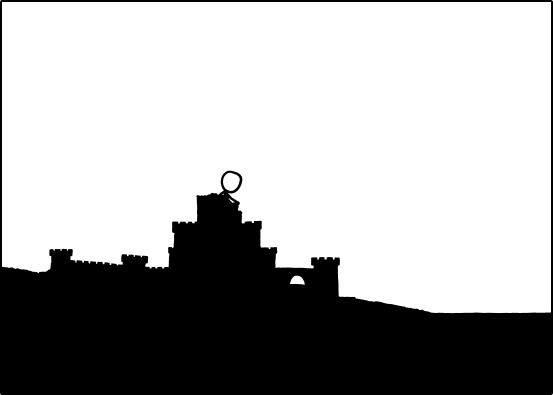 Last panel Black Hat Guy rides a tsunami onto the castle, bearing a flag. awwww this is epic. the suspense is killing me.